With the Portworx 1.6 release, we are announcing the availability and integration of the OpenStorage SDK into the Portworx portfolio. This blog will help you understand what OpenStorage is and what the SDK can do. Specifically, this blog goes into details about how to use the Python SDK but the SDK is also available for Go and many other languages. OpenStorage is an open-source project maintained by Portworx which facilitates the provisioning of cloud native volumes for Kubernetes. It allows you to run stateful services in Linux Containers in a multi host, multi zone and multi region environment. It plugs into CSI and Docker volumes to provide storage to containers and plugs into Kubernetes to allow for dynamic and programmatic provisioning of volumes. What does the SDK do for me? Using the OpenStorage SDK gives DevOps teams the ability to control and automate their cloud native storage volumes via APIs in a flexible manner. Teams can take advantage of version-controlled, infrastructure-as-code for the data management layer of their stack just like the rest of the infrastructure. Enough talk, how does it work!? Using the Python OpenStorage SDK in a real world Kubernetes environment. The first thing you want to do as a developer is head over to https://libopenstorage.github.io/ and take a look around. There are resources on how to use the SDK with both Go and Python and some information worth reading. To setup your python environment, check out the OpenStorage Python Tutorial. Note: To follow along with this post, make sure you are using Python3 so asyncio works as expecrted. Here is an example of using mkvirtualenv if you need to specify you want python3 in your virtualenv. Note also, the SDK will generally work with Python2 or Python3. Let’s move onto using the SDK in a real scenario with real Kubernetes StatefulSets! To follow along, or to make a copy of what is used in this blog post, clone this OpenStorage Python Examples repository. Next, you will need a Kubernetes Cluster. You can setup one up using your favorite deployment method such as EKS, or vagrant, just make sure you have at least 3 worker nodes that have at least one free disk so that Portworx can consume it. Once you have a Kubernetes Cluster ready, we can install Portworx on the cluster so we can use the SDK. First, get the nodes in the cluster using kubectl, we want to make sure there are at least 3 workers, since Portworx needs a quorum of three nodes for a storage cluster. You should produce a DaemonSet spec that is appropriate for your environment. One way to do that is to walk through the steps at https://install.portworx.com/, which will give you an option to download the spec locally or run `kubectl apply -f` directly against a produced URL. (optionally) You can produce the DaemonSet Spec via Curl. Here is an example below. Note that the SDK is only available in Portworx versions 1.6 and above. Notice that there are certain variable such as c= for cluster name, and kbver= for kubernetes version. Find a list of available variables here. $ curl -L -o px-spec.yml "https://install.portworx.com/1.6?kbver=1.11.2&b=true&f=true&c=px-cluster-01ac9cb3-0b04-45c1-9469-6fc1e2f1c094&stork=true"
Once you have the spec, you should apply it to your Kubernetes cluster which will create the resources, DeamonSets and other Kubernetes objects needed to run Portworx. Example output below. Now that we have Portworx Installed, let’s interact with the cluster. First we need to access the Portworx CLI, so let us setup access to the pxctl cli via kubectl. [ryan@server kubeup]$ alias pxctl="kubectl exec $PX_POD -n kube-system -- /opt/pwx/bin/pxctl"
Now we can execute commands such as pxctl status and pxctl volume list locally without using kubectl. Now that we have Portworx up, we can interact with the newly available OpenStorage gRPC API at port 9020. (The HTTP API is available at 9021 and you can visit the Swagger API at 9021/swagger-ui/) What you will want to do first in order to use the examples is export the endpoint (any node in your Portworx cluster or a load-balancer endpoint to N portworx nodes will do) so that our scripts can use it. Let’s create a small application called create_vol.py which will create a volume and create a snapshot of the clean state volume. Awesome, now let’s see if that output translates to our Portworx cluster running on our Kubernetes cluster. Awesome! It does. Now let’s write a small app called list_volumes.py which, exactly as it sounds, list the volumes. 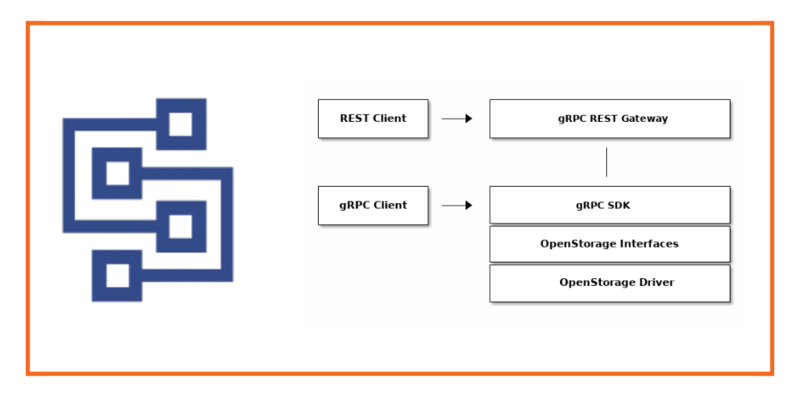 Here we’ll use the Enumerate function of the OpenStorageVolume service from the gRPC API along with the api_pb2.SdkVolumeEnumerateRequest() Message. Awesome, the ID’s match the IDs from the pxctl command! Now that you can start to see how this can be used against a real Portworx cluster running on Kubernets, let’s put together a real life workflow. Whether you have an end-user perspective or an operator’s, here are a few examples of how the SDK could be used. Design an operator or an application which watches or listens to events from Kubernetes such as volume creation. As a company policy, you can enforce that with every new volume, a certain snapshot schedule be applied to it, or that an initial snapshot or cloud backup should be taken. Automate the creations of Pods, PVCs, and application workflows all through code! This is powerful because the creation of applications through spec files can be combined with code that takes actions on your data-management layer all in version-control. Simply design a workflow in Python to interact with your Kubernetes+Portworx cluster in code. Let’s put a sample workflow into action that does a few useful things. “Watch” the Kubernetes Cluster for events and capture the creation of your database and associated volumes. When a PV creation event is found, asynchronously take a clean snapshot of the portworx volume associated with it using the SDK . Check the Status of your Backup using the SDK. First, you will need to make sure you Portworx cluster is setup to use Kubernetes Secrets, you can do this during installation time, but the above instruction will work if you didn’t initially setup your cluster up to do so. Next, let’s setup our environment. We’ll need to install some dependencies and export environment variables to tell our workflow example where our kubernetes configuration is. Next, let’s create our Cloud Credential and capture it’s ID so we can use it later to upload our CloudSnaps. Make sure and export the ID for use in our workflow. Next, we’ll create our storage class. You can learn more about what parameters are available in Portworx StorageClasses here. Next, we’ll start our control loop “watcher” application. This “watcher” will monitor Kubernetes PersistentVolume (PV) events for Portworx volume creation messages and apply a series of actions to a volume once one has been identified. In this case, these action are snapshotting the new volume and making an initial cloud backup to AWS. This is only an example, but you can see how this type of “apply action on events” workflow could be applied to many other scenarios. # Set the API, Watcher and Async Loop. # Let's only look at "new" ADDED volumes. # Have we already taken action on this pvc? Warning: There should be no output unless you have some existing Portworx volumes. In this case, the logic in this script will snapshot and backup any “replayed” events of added volumes and create snapshots and backups for each of them. View that the MongoDB StatefulSet have come up. List the PVCs that the StatefulSet created. Now, you should see some output from our program which detected the new volumes and took action on these volumes using the OpenStorage SDK. We're going to do things using the OpenStorage SDK! Creating a snapshot per company policy of 697115714207147996! Creating a snapshot per company policy of 397645254196029208! Creating a snapshot per company policy of 675886615386978767! Next, we can take a look at the status of any of our CloudSnaps by using a small python program called “show_cloudsnap.py” that uses the SDK to list the status of a cloud backup of a particular volume. We can use the output from above to view the status. See below. Note: that the stats is “SdkCloudBackupStatusTypeDone” which means it is done. We can also now list the snapshots related to the parent volume by its PVC name using pxctl. See below. Notice the “clmanual” in the name of our CloudSnap. Next, let’s get the ID of the cluster so we can view our cloudsnaps in the AWS Console. Then, we can double click into the UUID and see all three of our volumes all automatically snapshots and cloudsnaps by using the OpenStorage SDK combined with and Event Watcher for Kubernetes. Todays DevOps centric world includes initiatives such as “Infrastructure as Code” allowing teams to check-in code that manages VMs, Networks, Clusters and more. What we’ve shown here is a way to add to that portfolio of code using the OpenStorage SDK, letting teams automate their data management layer instead of using CLIs and GUIs. Here at Portworx, we use this SDK internally so we battle test and trust the solution. You’ll be well on your way getting the automation, control and flexibility our of your data layer in minutes. Remember, you can find more information at the OpenStorage github website. Here are links to the Python Tutorial , Swagger API, and API documentation. You can also find all the examples used here today available at this github link. Feel free to try out the SDK with the release of 1.6 or by using the Mock Server. We are happy to collaborate and feel free to stop by the github page with issues and concerns. Happy coding!